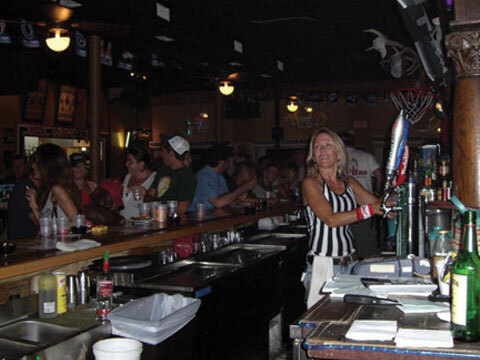 Welcome to Big â€˜Uns Sports Bar in the heart of Old Town Key West. Big â€˜Uns is Key West's newest and best sportsbar. Located at 218 Duval Street, Big â€˜Uns has 16 high definition flat screen TV's where you can watch all the games all the time. On game day, grab a seat in front of the two big projector TV screens and cheer for your favorite team. Share a bucket of ice cold beer with your pals and settle in for the afternoon or evening! If your game is not on, rack up the balls and play pool â€” pool tournaments will be starting soon. Big â€˜Uns also has PGA golf, interactive boxing, foos ball, pinball, an on-line jukebox and more. Big â€˜Uns has live entertainment Wednesday thru Saturday nights. Matt Avery takes the stage and holds you captive until the small hours of the morning playing everything from 80's favorites to today's hard rockin' hits. Matt has the ladies dancing on the bar and the guys hanging from the ceiling. Not only is Big â€˜Uns a great place for entertainment or to watch the games, but our friendly staff offers great drinks at great prices. Check out the daily specials.